In his second blog on COP 22, the climate conference that took place in Marrakech from 4 -16 November 2016, UNEP FI Climate Change Officer, Remco Fischer asks what was accomplished in Morocco, and summarises UNEP FI’s contribution. In the wake of the monumental Paris Agreement last year, intergovernmental climate negotiators met in November in Marrakech, a city that 15 years ago in 2001, hosted the international climate COP 7. In 2001, governments convened to develop the ‘operational rulebook’ for the then imminent Kyoto Protocol – a set of agreements which afterwards became known as the Marrakech Accords. Likewise, the 2016 COP’s task was to begin the operationalization, the ‘fleshing out of the details’, of the long-awaited successor to the Kyoto Protocol – the 2015 Paris Agreement. How then did the climate negotiators gathered in Marrakech, rise to the double challenge of implementing the goals agreed in Paris while keeping the political momentum in place? With regard to advancing the rulebook for the Paris Agreement, the Marrakech talks are widely seen as having delivered. The Paris Agreement provides the rough outline of the future climate change regime. It specifies countries’ climate-related commitments, and includes mechanisms to facilitate an increase in their ambition. The devil, however, is in the detail, and clarifying the details is the role of the Agreement’s so-called rulebook. These include the extent to, and the manner in which country plans should be standardized. It also specifies how developed countries on the one hand, and the developing countries on the other, should report on the progress made vis-à-vis their domestic commitments; and how developed countries should report on the assistance they provide developing countries in the form of climate finance and technological transfer. Important outcomes in Marrakech include the setting of 2018 as the deadline for finalizing the rulebook, with a review of progress planned in 2017, as well as finding a home for the orphan issues that had not yet been explicitly included on the agenda of any of the relevant negotiating bodies under the Convention. These issues include the need to work towards a common timeframe for the delivery of countries’ climate plans, known as Nationally Determined Contributions (NDCs). Furthermore, by agreeing terms of reference and work-plans, the Marrakech COP was able to operationalize new bodies of the Paris Agreement such as the Paris Committee on Capacity-building, which will start work in 2017, as well as the Executive Committee of the Warsaw International Mechanism (WIM) on loss and damage. Many participants also felt clarity was provided on the preparations for the 2018 Facilitative Dialogue to take stock of collective progress towards the Paris Agreement’s long-term emissions goal and inform the review of NDCs. The Facilitative Dialogues are key to increasing the ambition of NDCs towards consistency with a 2 or 1.5 degree trajectory. Currently, NDC commitments remain too weak to meet this target, putting the world onto a dangerous trajectory towards 3.4 degrees. Despite the progress made in Marrakech on the procedural issues above, two areas within the negotiations remain controversial and unsettled: financing and pre-2020 action. A finance roadmap, published by a group of developed countries a few weeks before the COP was met with scepticism and criticism from developing countries. The roadmap tracks current flows of climate finance for developing countries and details how they foresee achieving mobilization of USD 100 billion of such flows by 2020. Critics argue that the definitions used for measuring public climate finance are not climate-specific enough suggesting that non-climate specific funding, such as for overseas development assistance more broadly, might be erroneously included. By tracking the face-value of concessionary loans, as opposed to the value of their grant-equivalent, the figures were being further inflated, and lastly, that the methods for quantifying the flows of private financing mobilized through public finance remained unclear. There is agreement between developed and developing countries that the imbalance between climate finance for mitigation (reducing GHG emissions) versus adaptation (building resilience to the physical effects of climate change) needs to be addressed. However, developed countries are only committing to doubling adaptation financing by 2020, while developing countries point out that adaptation finance should be quadrupled in order to achieve balance. Many countries, particularly developing nations, voiced concern over another imbalance: the emphasis currently put on climate action by countries post-2020 and the actions necessary pre-2020. While nearly all 197 Parties to the Climate Convention (UNFCCC) have signed the Paris Agreement and submitted a corresponding NDC detailing post 2020-action, the treaty capturing the second commitment period of the Kyoto Protocol – running from 2013 until 2020 – has only been ratified so far by 73 countries, and has, therefore, not been able to enter into force in the four years since its inception. In the days after the US election a number of countries sent a strong signal by re-confirming their prior climate commitment and ratifying the Paris Agreement, including the UK, Australia, Japan, Malaysia and Pakistan. China, who with the US – via a bilateral climate agreement in 2015 – contributed significantly to shifting the geo-politics of climate change in favour of a global agreement, issued a statement that any unilateral moves would not compel China, nor many other countries, to deviate from their own decarbonization plans, given both the ecological, as well as, long-term economic imperatives. Statements in support of continued US climate leadership, domestically and internationally, were also voiced from within the country, such as from both the executive and legislative branches of the US’ most populous state, California. A few days after the election, more than 365 US businesses and investors, from more than a dozen Fortune 500 firms to small, family-owned businesses across more than 35 states, sent a message reaffirming their support for the historic Paris climate agreement and the need to accelerate the transition to a low-carbon economy at home and around the world. UNEP FI works at the interface between governments, other public policy makers, and the finance sector, and has a critical role to play in the intergovernmental climate process. In Marrakech, we focused on two of these roles: promoting finance sector leadership and best practice on climate change, as well as clarifying the roles and requirements of private finance in climate change mitigation and adaptation. Climate action by non-state actors, particularly businesses, financiers and investors, is a key topic now in the global climate talks. The rationale is that if the private sector shows conviction, determination, and leadership on climate change, governments will be compelled to do the same. 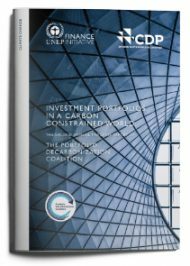 On 4 November at Climate Finance Day in Casablanca, Olivier Rousseau, Member of the Management Board of French public pension fund FRR, launched the Portfolio Decarbonization Coalition’s 2016 report on progress detailing how institutional investors have started adjusting portfolios worth over USD 600 billion. Download it here. The question of how the leadership shown by investors – such as those convened in the Portfolio Decarbonization Coalition (PDC) – can become the ‘new normal’, was addressed on 14 November at the Sustainable Innovation Forum. UNEP FI Head, Eric Usher moderated a discussion between the State Secretary of Germany’s Federal Ministry of Environment, Nature Conservation, Building and Nuclear Safety, senior executives of multilateral development banks (the International Finance Corporation and the European Investment Bank), and Amundi, one of the co-founders of the PDC. On 8 November, an event was held that highlighted how the energy efficiency financing strategies of individual financial institutions such as ING, coupled with the leadership shown by signatories to the UNEP FI statements on energy efficiency can support intergovernmental policy processes such as the G20 Task Group on Energy Efficiency Financing. The event was organised by IPEEC (the International Partnership for Energy Efficieny Cooperation), the AOB Group, and UNEP FI. On 11 November a finance sector panel highlighted the actions that AXA, Citibank, MN, Aviva, the New York State Comptroller and Deutsche Bank, are taking to both weather the new risks that climate change poses to the finance sector, as well as to capitalize on the opportunities presented by the climate economic transition. The event was organized by UNEP FI, the Global Investor Coalition (GIC), the Principles for Responsible Investment (PRI), and Carbon Tracker. On 11 November a panel discussed and agreed on the need for a new, comprehensive, global standard on private climate finance to replace the only existing, but incomplete standard focused on so-called ‘carbon financing’ in the context of the Clean Development Mechanism. The UNFCCC, the Climate Policy Initiative, CDP, ISO and the 2 Degrees Investing Initiative took part. Organized within the framework of the G20 Energy Efficiency Finance Task Group, a UNEP FI event on energy efficiency financing on 15 November presented the original policy/finance work of this group. Public and private financial institutions, including from developing countries, shared best practices and discussed how they can scale up energy efficiency financing. The Interamerican Development Bank (IDB), Moroccan UNEP FI member BMCE, Chinese UNEP FI member China Industrial Bank, and European Mortgage Federation, presented and discussed how they are increasing financial flows towards energy efficiency enhancements across sectors and asset classes. 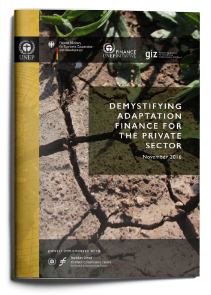 On 15 November, a side event discussed the specific roles of both fiscal, as well as financial regulation in mobilizing private climate finance, for both mitigation and adaptation. The event focused on both sides of the climate finance challenge: the policies and public interventions required to stimulate demand for climate finance, as well as a readily available supply of it. UN Environment was represented on the panel by Nick Robins, Co-Director of UNEP’s Inquiry into the Design of a Sustainable Financial System, and Karsten Löffler, Managing Director of Allianz Climate Solutions and Chair of UNEP FI’s Climate Change Group. The event was jointly organized by UN Environment, the International Monetary Fund (IMF), and the World Bank. On 16 November the Sustainable Stock Exchanges Initiative – which is co- convened by UNCTAD, UNEP FI, the Principles for Responsible Investment, and the UN Global Compact, held a conference addressing the roles of stock exchanges, particularly those in the MENA region, in mainstreaming climate related disclosures from companies to investors and in the integration of disclosed information into investment appraisal and capital allocation decision-making. Read more here. On 16 November UNEP FI moderated one of the sessions at this year’s High-Level Ministerial Meeting on Climate Finance. Convening representatives of both environment and finance ministries, as well as heads of country delegations, the meeting addressed the challenges faced in scaling up climate finance flows from both public and private sector sources. Speakers included UN Secretary General; the Executive Secretary of the United Nations Framework Convention on Climate Change (UNFCCC); the Ministers of Finance of Bangladesh, Burkina Faso, France, Liberia and Morocco; the Executive Directors of the Green Climate Fund (GCF) and the Global Environment Facility (GEF); as well as the Climate Change Ministers of the United Kingdom, the Maldives, Argentina, Sweden as well as Senior President of UNEP FI member, Yes Bank. Watch here. An issue that governments and negotiators continue to struggle with is how best to increase the flow of finance to address climate change. It is agreed that scale can only be achieved by mobilizing private finance. UNEP FI, through its Demystifying Private Climate Finance series, provides insights and guidance. The latest issue, launched in Marrakech on 7 November during a side event involving the German Federal Ministry for Economic Cooperation and Development (BMZ), GIZ, UNEP FI member Allianz, the Frankfurt School UNEP Collaborating Centre, and the Government of Antigua and Barbuda, focuses on the particularly complex and ill-understood challenge of adaptation financing. The new UNEP FI report can be downloaded here, and a recording of the event can be watched here. Read Remco Fischer’s first blog from COP22, ‘The Good, the Bad and the Unknown’ here. Images: Marrakech signpost courtesy of Bab Ighli, Climate Finance Day Panel courtesy of Casablanca Finance City Authority.